Most oral surgery practices have 3D CT scanning machines. Chances are, if you plan to get a dental implant or jaw surgery, you will also need to have your mouth scanned with a cone beam x-ray like the one we have here at Torrance Oral Surgery Center. What Is a Cone Beam X-Ray? A cone beam x-ray is a machine that takes three-dimensional images of your jaw. The machine takes cross-sectional scans of your mouth from different angles. When viewed together, these images provide a detailed and accurate picture of exactly where your teeth and other facial structures are located. Jaw surgeries are complex. Your jawbone hides a wealth of delicate and essential structures such as blood vessels and major nerves. If one of those is accidentally harmed during oral surgery, you could end up with permanent damage. A Torrance oral surgeon reduces your risks of complications by carefully examining your mouth and planning the surgery before starting to operate. Detailed imaging and treatment planning will prevent damage during an implant procedure and other jaw surgeries. A CT scan is currently the best tool for mapping your mouth and planning a safe procedure. Are Cone Beam X-Rays Harmful? A CT scan in the oral surgeon’s office exposes you to less radiation than even a set of traditional dental x-rays. You won’t need a 3D CT scan very often; the occasional cone beam x-ray is perfectly safe and essential to having a successful oral surgery. 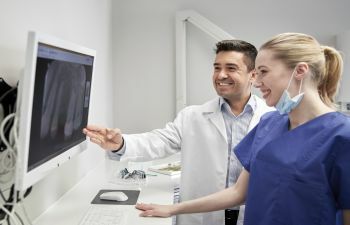 Learn more about cone beam x-rays and the other invaluable diagnostic technologies used here at Torrance Oral Surgery Center by calling our team.